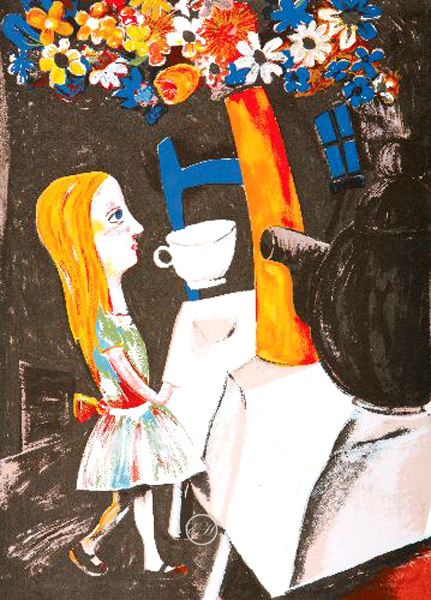 This Limited edition Silkscreen titled Always Tea Time was released in 2001 by Charles Blackman and is from his famous Alice Series, other titles are – Chess Game, Alice’s Jug, White Rabbit, Alice’s Adventures, Pink Alice just to mention a few. This series is sold out other than the stock on hand limited to one only, Lay Buys are welcome. There isn’t any,’ said the March Hare. ‘Your hair wants cutting,’ said the Hatter. ‘A Mad Tea-Party’, Alice’s Adventures in Wonderland, The original work to this Silkscreen was done as Tempera and oil on composition board, 135.0×96.7 cm and is in a Private collection. Here Blackman takes the Always tea time title literally and treats the prospect of Alice’s abstinence, in parallel with Alice’s [Barbara’s] necessary restraint during pregnancy, as akin to a sentence of death. There is no food or drink on the white tablecloth in this black-walled interior. Instead, there are three well modelled objects – a bloated teapot, a top-heavy candle vase and a tipsy cup – and three bent and illogical shadows. The white table cloth is starkly lit as if by a flashlight, and so are the objects. But the shadows are inconsistent with this unseen light source and they appear to spill over the edge like tea-stains. As well, their shapes double as the motifs (neck-tie, pocket and sleeve) of a stuffed, starched shirt. Faced with this irrational line-up on the table, a profiled, penitent Alice seeks enlightenment from above. Wearing a well washed, dry-brushed dress, a simple clerical collar and with her best foot forward, her blue eye is focused on the far side of the canopy of intoxicated blooms that swirl across the ceiling. Her suppliant arm shields the drip of her juicy sash, a wine glass concealed in its bow. Its leaking trail of red sets fire to the yellow of her too-long hair, a curve of flame that calls through the golden trumpet flower above to a reciprocal image – the yellow-into-red of the inclining vase. In this surreal trial-by-teapot, the overfull teapot dribbles from below as it interrupts the vase, rounding its spout to pronounce the verdict. In turn, the verdict passes through a black void to the blue rails of the empty chair that forms the gavel that touches the floating cup that casts a moth-like shadow as it points to the door – in short, the sentence of death. Not only does one thing lead to another, but everything plays a part, including the sense of time having stopped. Here the twilight blue of the paned windows suggests the hour of six o’clock – Melbourne tea time and pub closing time.